Pipette Stand Vertical is a stable, non-corrosive, detachable Stand which can hold 28 pipettes with maximum dia 14 mm. The heavy base measures 225 mm in diameter and a Polypropylene coated square rod measuring 375 mm in length is screwed into the base. The top disc that can be fixed on the rod has holes for holding pipettes while the lower one has pilot holes where the pipette tips rest and liquids drain down to the base. These discs can be adjusted on the rod according to the length of the pipette. The arrows provided on the discs should be kept parallel to ensure that corresponding holes are being centered. 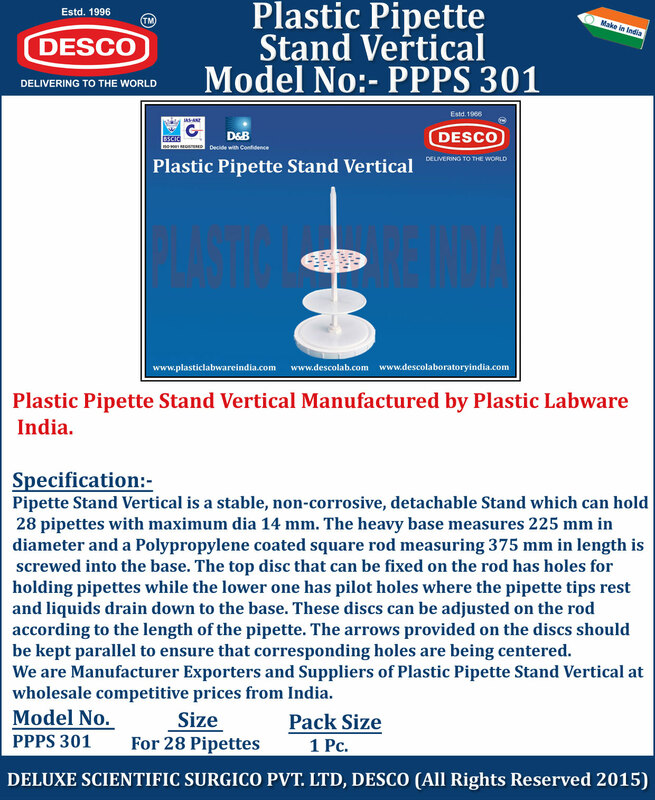 We are Manufacturer Exporters and Suppliers of Plastic Pipette Stand Vertical at wholesale competitive prices from India. PPPS 301 For 28 Pipettes 1 Pc.